From the northwest you start either outside Schüpfheim (728m) or higher up at Flühli (882m) if you managed to get over the Hilferenpass/Hilferepass (1290m), but that involves going up to 1304m and walking part of an easy connecting track (625m) between the asphalt roads on both sides (you start at 1307m down to Flühli). The road via Sörenberg is nice, but there could be much traffic up the Mariental in Summer. First after Sörenberg the real climbing starts and but as it is less than 500 height metres up this is the easy side. 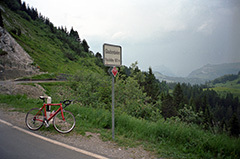 From the east the climb starts in Giswil (490m). From there it is a long and nice climb and on this side you have good views over the Sarnersee – it is after a so-called ‘panoramastrasse’. On this side you come to the high point of the road (1611m) before the actual pass (1565m), and the pass sign is placed at the high point as it is usually regarded as the pass point for road traffic even if not at the actual pass (I prefer in cases where the pass is not quite in the locality of the road height to merely state the road height also). This is a fairly hard climb, not unlike the parallel Glaubenbergpass/Passhöchi Beizli (1543m). Other comments The asphalt on the road to Wagliseiboden (1317m) (a pass without a proper name for all I know) ends there and I am not sure how good the gravel track down the other side is (Hilferenpass is likely better anyway).